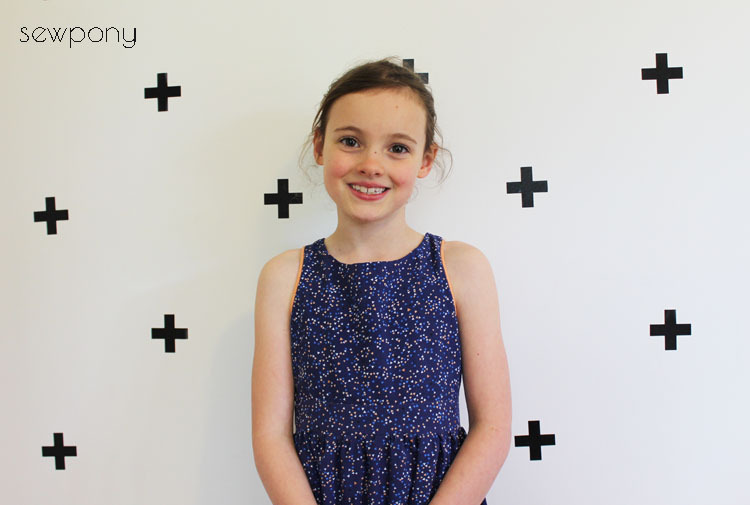 Last week I sewed up a new dress for Isabella. 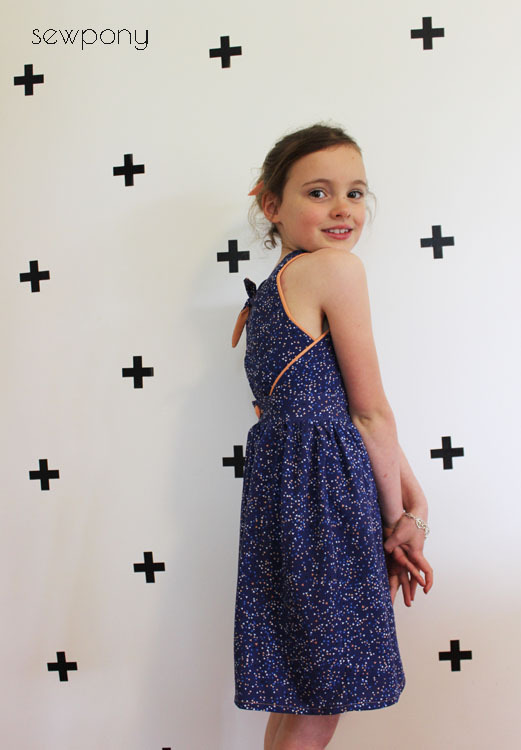 I had loved pictures I had seen on Instagram of the Just knot it dress by Mind the whale. The pattern is currently only in Dutch, but I decided to buy it anyway and work my way through the instructions based on the visual! The design is so elegant and unique. I really love it! I used some beautiful Meet me at six fabric to make this dress which was perfect for this style. (Please excuse the fact that these crosses look crooked in these photos - I am not sure why, because they look straight on the wall in my sewing room)! 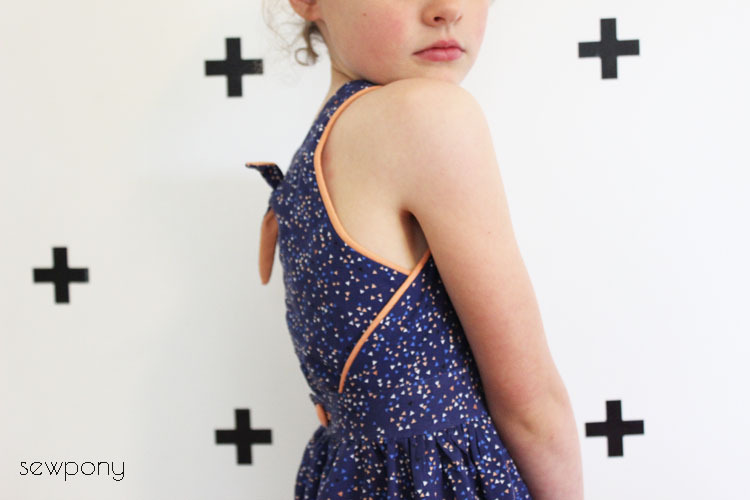 Mind the whale is pattern maker Riet from Belgium. Her shop is lovely, as are her designs. The pattern was beautifully laid out and so thorough. Experienced seamstresses could manage this pattern even though it is in Dutch with the pictures and a bit of help from google translate. The fabric I used for this dress is 'Triangles Blue' from the See you at six collection that I bought from MaaiDesign (love that shop)!! The drape of the See you at six fabric is beautiful. Isabella said she would wear dresses every day if they were all like this! Tick. I had some soft coral cotton fabric that I bought from the op shop that was the perfect match with the little coral coloured triangles in the main fabric. I made the piping from the lining fabric too. Isn't the back just stunning? The front and back bodice pieces are very cleverly designed to allow them to overlap at the 'side seams' and piping really accentuates this feature. These overlaps can be omitted for regular side seams too. Pleats can also be incorporated in the front bodice as can a button tab at the back opening (you can see all these options on Riet's site). 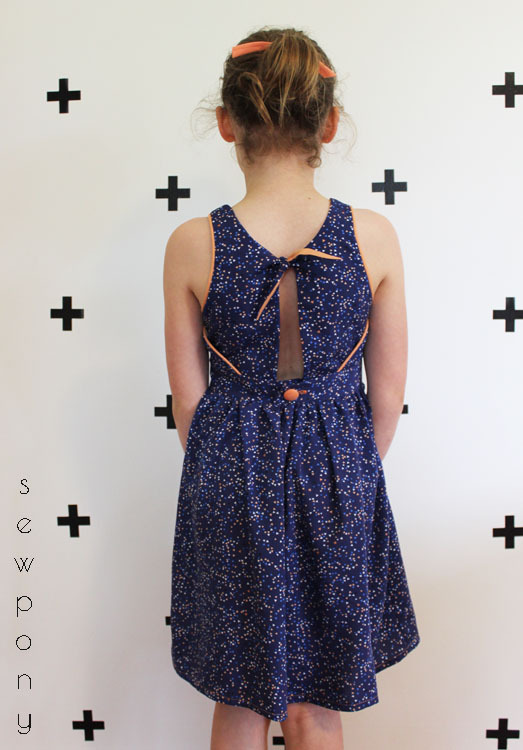 I will certainly be making more Just knot it dresses in my sewing future! I have also heard that the pattern may be being translated into English? I am not certain of this but I am sure it would be a hit! We have good taste don't we?! Amazing, such a beautiful dress! Love it!